28 september 2018: lees het advies van het Zorginstituut om de mammaprint uit de basisverzekering te halen. Het definitieve studierapport: Adjuvant Chemotherapy Guided by a 21-Gene Expression Assay in Breast Cancer is deze week gepubliceerd in NEJM en is volledig gratis in te lezen of te downloaden. Met als conclusie dat alleen hormoontherapie een gelijke overall overleving op 10 jaar geeft dan chemo plus hormoontherapie. De mammaprint kan voorspellen welke vrouwen wel en welke vrouwen geen chemo nodig zouden hebben. Zie verder alles over de mammaprint hieronder en in gerelateerde artikelen. Dat ook vrouwen met hormoongevoelige borstkanker een mammaprint absoluut nodig hebben blijkt uit een nieuwe Nederlandse studie onder 660 patiënten in 33 verschillende ziekenhuizen in de periode oktober 2013 t/m december 2015. Maar liefst 51 procent kreeg na een mammaprint met de 70 genentest van de mammaprint een ander behandelplan voorgesteld dan wat de oncoloog had voorgesteld op basis van de CT-scans enz. voordat er een mammaprint werd gemaakt. En dan te bedenken dat nog maar de helft van de vrouwen met borstkanker deze mammaprint krijgen. vaak nog op eigen verzoek. Between October 1, 2013, and December 31, 2015, 660 patients, treated in 33 hospitals, were enrolled. Fifty-one percent of patients had pT1cN0, BRII, HER2-Neu-negative breast cancer. On the basis of conventional clinicopathological characteristics, physicians recommended CT in 270 (41%) of the 660 patients and recommended withholding CT in 107 (16%) of the 660 patients. For the remaining 43% of patients, the physicians were unsure and unable to give advice before 70-GS testing. 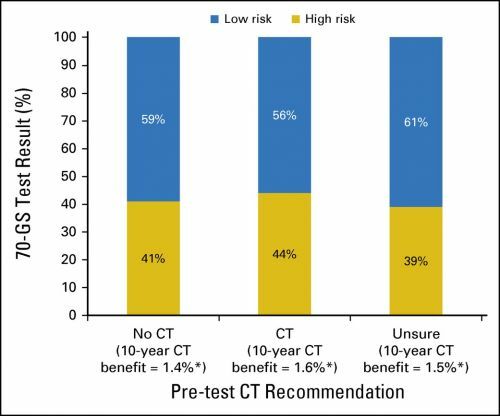 In patients for whom CT was initially recommended or not recommended, 56% and 59%, respectively, were assigned to a low-risk profile by the 70-GS (κ, 0.02; 95% CI, -0.08 to 0.11). After disclosure of the 70-GS test result, the preliminary advice was changed in 51% of patients who received a recommendation before testing; the definitive CT recommendation of the physician was in line with the 70-GS result in 96% of patients. Het volledige studierapport: Impact of 70-Gene Signature Use on Adjuvant Chemotherapy Decisions in Patients With Estrogen Receptor–Positive Early Breast Cancer: Results of a Prospective Cohort Study is gratis in te zien. Anne Kuijer, Marieke Straver, Bianca den Dekker, Annelotte C.M. van Bommel, and Thijs van Dalen, Diakonessenhuis; Anne Kuijer, Sjoerd G. Elias, Sabine C. Linn, and Thijs van Dalen, University Medical Centre Utrecht; Sabine Siesling, Netherlands Comprehensive Cancer Organization, Utrecht; Carolien H. Smorenburg and Jelle Wesseling, Antoni van Leeuwenhoek Hospital; Carolien H. Smorenburg, Jelle Wesseling, Sabine C. Linn, and Emiel J.Th. Rutgers, Netherlands Cancer Institute, Amsterdam; and Sabine Siesling, University of Twente, Enschede, the Netherlands. Gene-expression profiles increasingly are used in addition to conventional prognostic factors to guide adjuvant chemotherapy (CT) decisions. The Dutch guideline suggests use of validated gene-expression profiles in patients with estrogen receptor (ER) –positive, early-stage breast cancer without overt lymph node metastases. We aimed to assess the impact of a 70-gene signature (70-GS) test on CT decisions in patients with ER-positive, early-stage breast cancer. In a prospective, observational, multicenter study in patients younger than 70 years old who had undergone surgery for ER-positive, early-stage breast cancer, physicians were asked whether they intended to administer adjuvant CT before deployment of the 70-GS test and after the test result was available. In this prospective, multicenter study in a selection of patients with ER-positive, early-stage breast cancer, 70-GS use changed the physician-intended recommendation to administer CT in half of the patients. Reageer op "Mammaprint verandert voorgestelde behandeling van hormoongevoelige borstkanker bij 51 procent van de vrouwen in vergelijking met behandelplan zonder mammaprint."